Today we walked 4.2 miles (6.8 km). The lights came on at 6:00 this morning and we woke up not wanting to get out of bed. The sun came up at 6:40 but we sure didn’t see any of it. It was still cold, gray, and rainy like the night before. Everyone seemed to be lingering a bit, trying to postpone the inevitable, but eventually we all made our way outside and began the day. It started off ok, with a picture next to the sign I’ve seen so many times in other people’s blogs. I’ve been waiting a long time to see that sign. 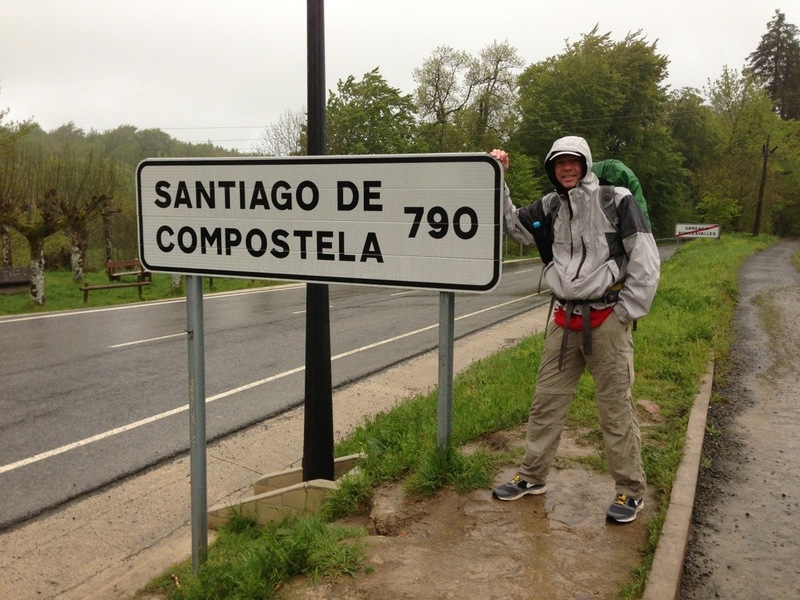 790 km (491 miles) to Santiago! A sign surely put there just for us peregrinos. But then came the cold wind with the rain, and things started going south. The trail left the main road after the first little town, and switched to a muddy, wet, path through the forest. We managed to keep our feet dry at a couple of muddy stream crossings, but after a while the wind and the rain won out and we were soaked all over, despite our rain gear. After a couple of hours we were wet and cold and we’d had enough, so we stopped at the next little town and checked in to an albergue. Apparently we’re in the town of Espinal. We’ll stay the night here and hope for better weather tomorrow. We’re now showered, warm, and dry in our sleeping bags, and we even have WiFi. What more could one ask for? Other than some sunshine, of course. I’m glad you decided to call it a day. I spent only 20mins. In the cold wind and rain waiting for the train so I understand. Thank you for the beautiful pictures! They are amazing and along with your words carry me along on the journey. Not sorry I am missing out on the cold and wet. May the sun be with you!